375 degrees F. Position rack in center of oven. 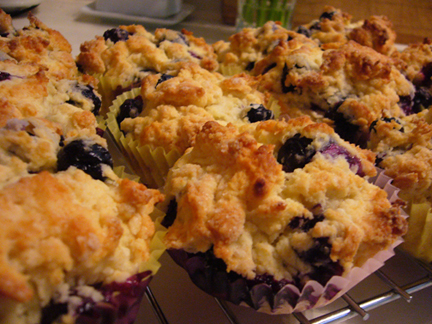 Butter or spray with a non stick cooking spray 12 – 2 3/4 x 1 1/2 inch muffin cups. In a bowl whisk together the egg, buttermilk, oil, and vanilla extract. In another bowl combine the dry ingredients: flour, sugar, baking powder, baking soda, and salt. Fold in the berries. With a rubber spatula fold the wet ingredients into the dry ingredients and stir only until the ingredients are combined. Do not over mix the batter. Fill each muffin cup almost full of batter. Place in the oven and bake about 20 minutes. Transfer to a wire rack and let cool for about 5 minutes before removing from pan. Dust with powdered sugar.